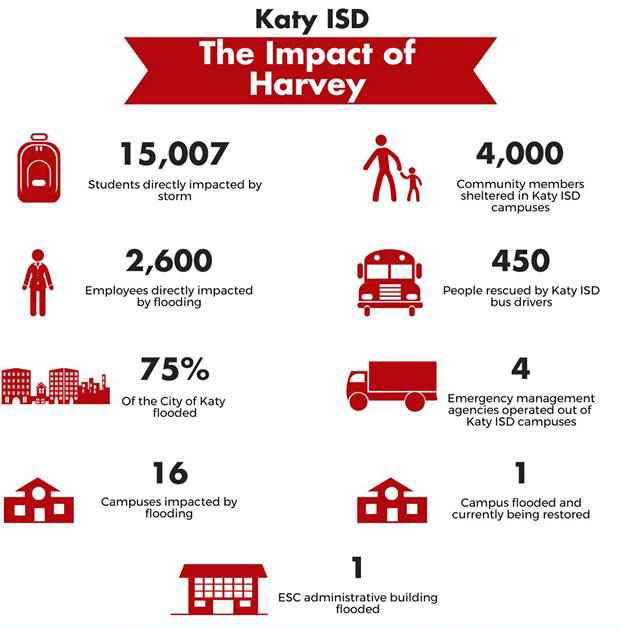 In the wake of Hurricane Harvey, 15,007 students and 2,600 employees of Katy ISD are recovering from direct impact of the storm. 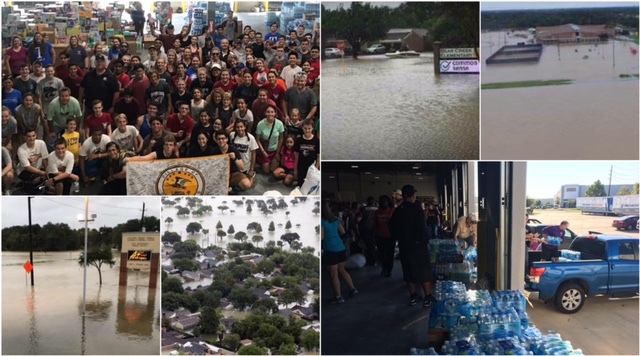 Despite the destruction, the Katy community has proven to be “Katy Strong” in providing support to those in need. In keeping with that theme, the Katy ISD Education Foundation is launching an initiative that will provide support for Katy ISD families and staff adversely impacted by flooding in their homes as a result of Hurricane Harvey. The Foundation will collect donations from the community, while Katy ISD campuses will identify students and staff in need of support. Any donation you can make regardless of size will help us help our Katy ISD families and staff. Please share this opportunity on social media and email to help spread the word. About the Katy ISD Education Foundation - The Katy ISD Education Foundation unites people and companies with big hearts and a big belief in Katy ISD teachers and students to provide unprecedented opportunities for both. To learn more visit www.katyisdeducationfoundation.org. Note: All contributions will be tax deductible, and you will receive a tax receipt when your donation is processed. If we don't reach our goal, we will use all of the funds raised to support as many families and staff in need as possible. We're almost done! Our campaign will end at midnight tonight. We are truly, deeply thankful for your contributions. Our investor list is full of longtime and new friends from far and wide. We will distribute the funds to our Katy ISD staff and families before Thanksgiving. You've helped make that holiday and the recovery process a little easier for them. It's an honor for us to bless them on your behalf. Thank you. It's rally time for our Katy ISD staff and students. We've reached our $90,000 goal . . . let's keep going and help even more families. Thank you to everyone who has supported us so far. We are thrilled and blessed. Keep sharing with your family and friends far and wide. Final deadline to give is October 16. 2,400. That’s the approximate number of Katy ISD students who have been displaced by Harvey. In response, we have extended our fundraiser an EXTRA WEEK to end on October 16 and raised the goal to $90k. You all are amazing - thank you for your generous donations that have helped us raise almost $65,000! Katy ISD is a truly special district and we are honored to help play a part in helping those who make it so great - the students, staff, and their families! Check out these sweet comments about Katy ISD. Please reach out to your network of friends, family, acquaintances, business associates - we can surpass the $65k mark! Help us find and secure matching fund opportunities. The flood waters are gone, but the needs are still rising. Let’s keep going. We can't thank you enough for all of the donations and kind words! We’ve topped $50,000 with 344 contributors. Thank you! Check this out from our Twitter feed: Alicia Leung, a Katy ISD staffer and Education Foundation grant recipient recognized her home in Dr. Hindt’s video. Her thanks is our thanks to you. Keep reaching out and reminding your network of friends, family, acquaintances, business associates. Share the link across your social media platforms. Message from Katy ISD Superintedent Hindt! Over $23,000 Raised So Far! What a great start! Thanks to the generosity of 190 investors we reached more than 60% of our $30,000 goal in 48 hours. So, we’ve doubled the goal to $60,000 as we surge ahead collecting even more support for the thousands of Katy ISD staff, students and their families affected by flooding in their homes. Please reach out to your network of friends, family, acquaintances, business associates. The response has been great. The needs are greater. Let’s keep going. Thank you to our Louisiana neighbors from South Highlands Elementary Magnet School! We are so grateful for your thoughts and contributions! Thank you to our new friends at Sandstone Elementary! We DO feel the love all the down here! Thoughts are with Katy clear in Illinois. Stay Strong!!! You are in our thoughts, and we wish you the best as you recover from Harvey. Stay strong, Katy! Students at Sandstone Elementary School in Billings, MT have happily raised $300 to donate to schools in Katy, TX through our KC (Kindness and Compassion) Club. Our thoughts, prayers, and warm wishes have been with you the last several weeks. We hope you are able to feel the love all the way from Montana! Your contribution is so appreciated! We are so thankful to all of our community members and business partners who have stepped up to help Katy ISD families in need! Thank you for your generous donation in honor of Dr. Sanee Bell and Morton Junior High. We are truly grateful! We are very Proud of Katy ISD Community. Thank you for setting this up to help our community and teachers. I look forward to seeing updates on how the money has benefited students and staff! Please use this donation for helping affected teachers and their families belonging to Hazel S Pattison Elementary School. N2 Learning is honored to be a partner with Katy ISD. We are making this donation to recognize Dr. Sanee Bell and Morton Junior High. Please earmark this to Jenks Elementary families os staff. Thanks. Our Harvey fundraiser is a special project that will end in October. 100% of funds raised will go to Katy ISD staff, students and their families affected by flooding in their homes. Who receives support will be determined by campus administrators, who are keenly aware of their staff and student needs. How much support is given and how many are helped will be completely driven by how much we raise. Hope this helps! Feel free to contact us at foundation@katyisd.org if you have other questions. Tri-West High School Community from Lizton, Indiana is keeping all of those impacted by Hurricane Harvey in our thoughts and prayers. Thank you for reaching out! The Katy ISD Partners in Education is managing those relationships. You can reach them at foundation@katyisd.org. Thank you for being helpful in getting Katy back to normal after Harvey. Katy schools have been a big help with programs that inspire my grandson. We are looking to "adopt an elementary school" - we not only want to send some $ from our fundraising efforts but we would also like to establish a "pen pal relationship" with the school for this school year if possible...Can you help me do this? Prayers and support for all those who suffered losses of any kind! We love living in Katy; thanks for helping all of us to spread that love!! As an impacted Katy Family from Hurricane Harvey, and with in the KISD school district for 13+ years...I am interested to know if there is there a plan on how the donations will be used? Any feedback is much appreciated. My heart goes out to all affected by Hurricane Harvey! I'm thankful to see so many people come together in this time of need and work to rebuild & grow! My family and I hope those in KISD who have suffered a loss recover quickly. A group of 5th grade girls decided to have a bake sale/lemonade stand to raise money for hurricane victims. One of the parents involved attended Mayde Creek Elementary-- Tara Nyc, Class of 1984. We are from Cranford, NJ and our school flooded during Hurricane Irene in 2011. We hope this helps. I hope all those who were affected by Harvey will be able to get back to some normalcy soon. Stay safe and thinking of all of you. My family has all of you affected by this in ours thoughts and prayers. Praying for elll Katy ISD staff affected by Harvey. Prayers for the affected families. The money we are donating came from a book sale fundraiser we held this past weekend at Boston University. We are thinking of all of you down there in Texas. We are Katy strong, together, in our prayers for always. The Katy ISD Education Foundation is a 501(c)(3) nonprofit that serves as an investment for community minded businesses and individuals to invest and enrich the lives of students at Katy Independent School District. For more information, visit www.katyisdeducationfoundation.org.